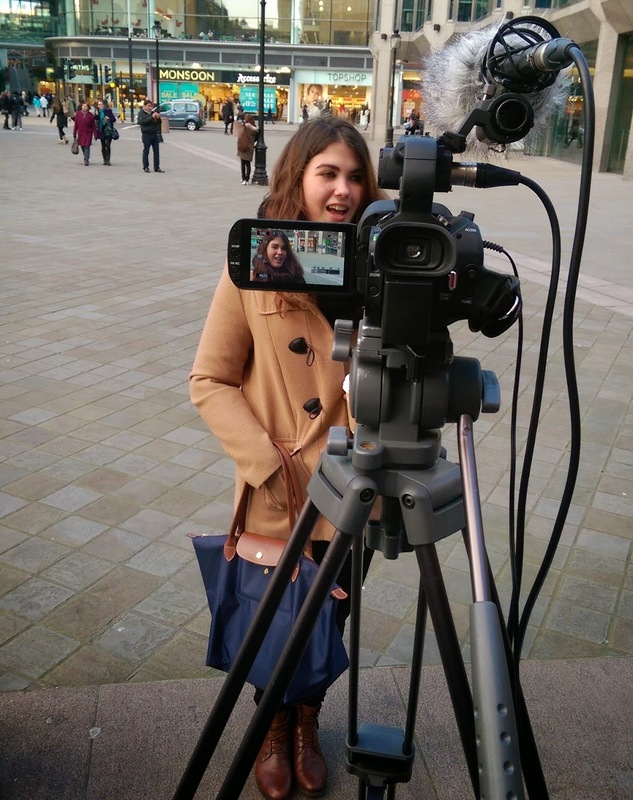 Vox pops were the order of the day today as Tom sent us on the streets to film a three minute news piece on a subject of our choice. Emily, Alice and myself chose the issue of tourism. We decided to film roughly six tourists and six locals and ask them their opinions on London and how friendly a place it can be. A few people persisted with getting our details and asking when it would be online or on television. So we may have told one or two of them that it would be published on the Press Association's website. Anything to get the best answers out of our interviewees, right? 13:30 and we had our first hiccup. The man above was half way through what seemed like at the time the best interview we were going to get all day. He remembered to include the questions in his answers and the ones he gave were gold dust. I think we were three questions in when we were shut down by the Man. 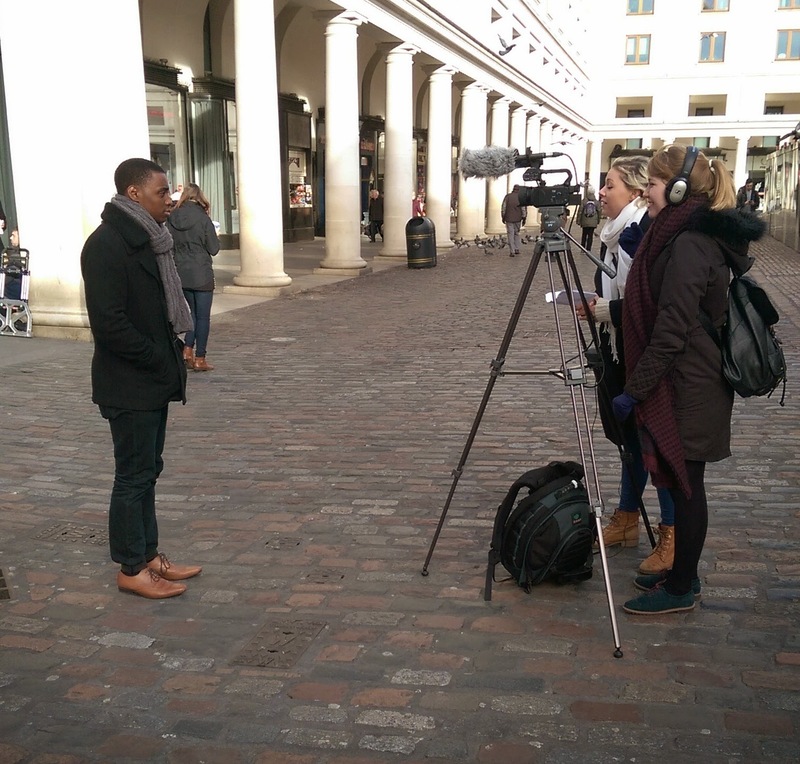 Apparently you cannot film (on a tripod) in Covent Garden. What kind of surveillance state do we live in? George Orwell would be spinning. 14:30 and we had our second problem! Our footage was fantastic, we were on schedule with our locations and we had already filmed eight vox pops out of twelve. Suddenly our battery died. No problem... we'll get out the spare and continue onwards. We still had two hours to film four or five people. We put in the spare that we assumed would be fully charged. But of course, it wasn't. Completely empty. Zero. Zilch. Nul points. With time running out we decided to go back to the office, charge up and head to Victoria cathedral for our final vox pops. And how we almost made it. We managed to get through two good interviews before the battery died again! Below was Amanda, a delightful tourist who despite her shy nature gave us some great answers. We put her in a close-up shot because, well, she looked good in front of camera! The time now is 17:30, we're all back in the office and we've all uploaded our material. Given the lack of experience most of us have in interviewing I think we've all done really well. We met some delightful people and some exuberant characters. And regardless of the obstacles we faced we had a thoroughly great time. Of course myself, Emily and Alice are going to go back out tomorrow and film a couple more vox pops before we begin editing on Monday. But we're not too upset. We've had such a fun time today and in the pursuit of producing something professional looking, we must get back out there and get this work finished! !